At only 16 years old, Olympic Development Programme rider Jess Varnish can already boast an impressive array of results. Varnish has gold medals in the European Junior Keirin Championships, the National Junior Sprint Championships, and is the proud owner of a silver medal from the World Junior Track Championships in Mexico.As winner of the West Midlands and Worcestershire Sports Personality of the Year Award, she has also become something of a local celebrity. Ambitious, focused and talented, Jess has her eyes on world titles and hopes to be on the boards in London 2012. 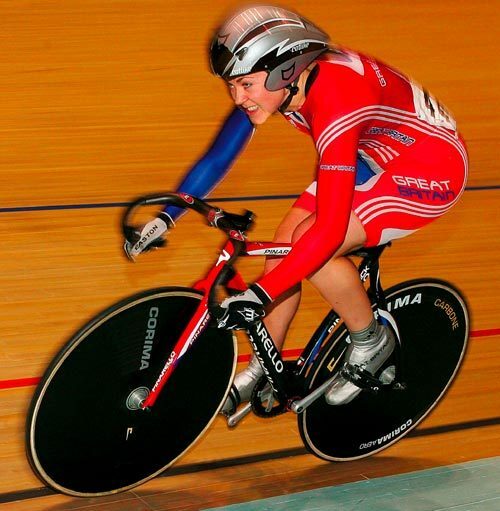 As the daughter of a cycle speedway world champion, Birmingham-based Varnish knows she will have to persevere with the long road ahead if she is to accomplish her long-term targets. However, with her proven results and the world-class coaching facilities available to ODP riders, a successful future for the aspiring junior looks more than likely. How did you get into cycling originally? Through my Dad. He got me into cycling when I started to do mountain biking. I did my first race when I was four or five and I just really enjoyed it. I’ve done cyclo-cross and track from a young age too. From there, I’ve been able to use the facilities of my club’s track, Halesowen A&CC, and work my way up through good results and improvements to the Olympic Development Programme. What is your experience of the Olympic Development Programme and what’s the most important aspect of the plan? It’s really good. It’s made me the rider I am now. I get all my coaching, my track time, my races and everything from it. Without it, I don’t think I’d be at the level I am currently. The coaching is the most important aspect to me; without my coach I wouldn’t have had a clue what training to do. It really helps having someone guiding you. The training camps are really good because you can learn from everyone else. Some people are good at certain things. We can learn as a group from each other’s strengths. What sort of training does a sprinter like you do in an average week? In the winter there’s a lot of gym work and then road-based miles to a maximum of about two hours; which is a lot for a sprinter really! This winter, I’m going on holiday in a few weeks to Australia. I’m taking my bike with me and will get in some gym work over there. It’s going to be nice to get in the sun; I’ll take my Dad out for a few rides! Who has the biggest influence on you as a rider? Victoria Pendleton – she’s dead nice. She helped out at the senior Nationals; she was giving me a lot of advice on tactics and stuff, so it was really good. I look up to her – I want to follow in her footsteps, and beyond, I hope! After winning gold in the European Track Championships, does it feel a bit surreal to have so many good results, so early? Yeah, it does feel good. It was a bit of a shock; I didn’t expect to do so well as a first year junior, if I’m honest. How are your feelings for selection for the Europeans next year? I’m looking forward to the Europeans, if I get selected. I’ve just got to keep doing exactly what I’ve been doing this year and just keep really enjoying it and continue being dedicated. With such a hard training regime leading up to the major international races, did you find it difficult to carry your impressive form over to the National Championships? It was OK, actually – I just kept ticking over. I got back from the Worlds about 10 days before, had a bit of a break, got over jet lag and did some speed sessions. That was that. What do you think is your biggest achievement: a gold medal at the European Championships, or the silver medal from the World Championships? The silver medal at the Worlds, definitely; everybody was there. With your nomination for the regional Sports Personality of the Year Awards, does it feel good to have recognition outside of cycling? Yeah, it does. I was actually surprised to get picked for that. I’ve just got to see how everyone else has got on in different sports and hope for the best. I’ll just see how it goes from there, really. Do your friends understand what you do? Sometimes. They don’t really understand why I can’t go out and party. When I show them my world medals, they’re a bit, “Woah!” They are great, though.